Ladies and gentleman… another Dumb Homebuilding Idea! The photo above shows a home that has a dumb homebuilding idea (in my opinion) inside of the home. I double-dare ya not to read more!! 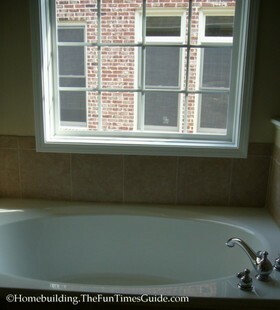 What you see below is a photo taken from inside of the master bathroom, looking over the garden tub at the home next door. It’s just a little too close for my comfort and privacy. What about you?? 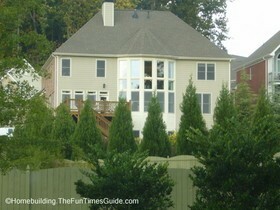 The photo at the top of the page has an arrow pointing towards the neighbors’ windows shown in the photo above. Over the past couple of years I witnessed the destruction and removal of a nice home on a large property that fell victim to progress largely due to location, location, location. In its’ place came…what else…a subdivision called Wallis Farms. 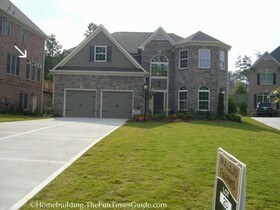 The homes start in the $400’s and quickly ascend from there. I’ve passed this subdivision in-the-making over the past year-and-a-half and, for some unknown reason, never bothered to venture within. Maybe it’s because the first couple of homes that were built near the subdivision entrance have the rear of the home visible from the street and they looked a little over the top for the lot sizes that they were built upon. That DOES NOT pique my interest in regards to ideas for homebuilding. For example, the rear of the home I have in mind has a 3-story convex wall of windows. The entire back of the house consists of windows! That’s a great idea if you live on the beach or if you have nothing but woods behind you. It’s a HORRIBLE (or DUMB) idea if the windows happen to face a very busy 2 lane road. See the image below. Folks…this is the view from the street. Anyway, that’s not necessarily the dumb homebuilding idea that this post is about. What this post is about is bathroom privacy. Time and time again, home after home we see large master bathrooms with great looking garden tubs with a BIG…CLEAR…glass window above them. Yes, you can put up window treatments, but why a window RIGHT THERE? Glass block is the way to go if you’re going to put a window in a room where you’re gonna git nekkid on a daily basis. Glass block will distort the light and shadows and you can still put up window treatments for extra privacy…or just don’t put a dang window there at all. How about just leaving it drywalled and hang one of those old, leaded glass framed windows that you see in antique stores all of the time. There are many more opportunities for decorating ideas when you leave the wall up…not to mention conserving energy! There are so many options to choose from to give homeowners (customers) bathroom privacy, yet some builders don’t seem to have a clue!